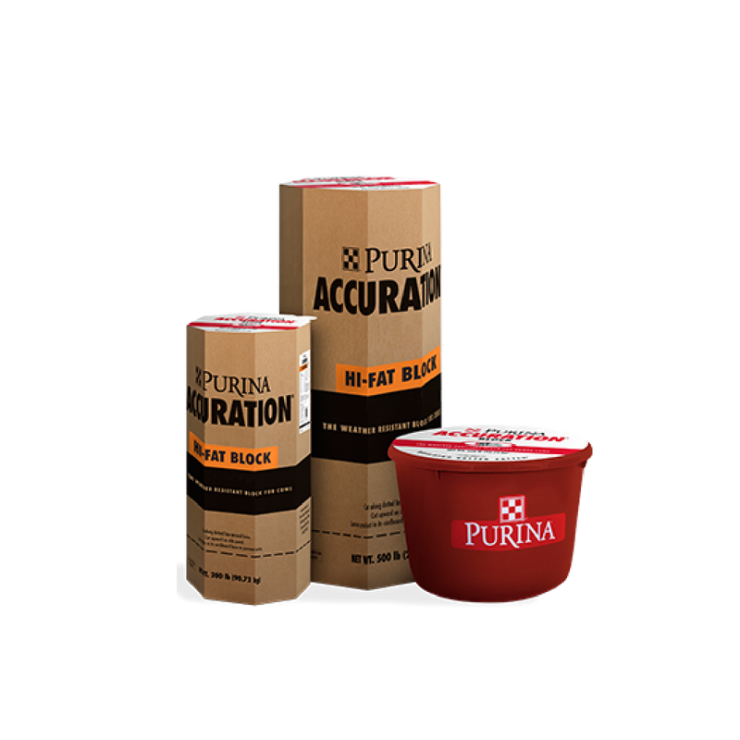 Purina Accuration Hi-Fat Block is a premium, weather-resistant, protein block with fat, vitamins and minerals added that is designed to balance nutrient deficiencies in fair quality forages such as native or improved grass hay or poor quality forages such as dormant grasses or crop residues. An Intake Modifying Technology product. Formulated to provide additional energy to cattle on poor quality forage or lacking energy in the diet. Helps maintain body optimal body condition and performance. Balances deficiencies in fair or poor quality pasture or hay to improve forage utilization and optimize animal performance. Convenient to feed, allowing feeding location to be varied in order to encourage more uniform consumption of the available forage. Utilizes proprietary Intake Modifying Technology® that results in controlled consumption of multiple meals of supplement per day. No need for special feeders or shelters. Convenient to feed. Feeding location can be varied to encourage more uniform consumption of the available forage. Higher energy level improves animal performance. No animal products; qualifies for many natural beef feeding operations. Balances deficiencies in fair or poor quality pasture, or hay to improve forage utilization and animal performance. Product maintains integrity and nutritional value when exposed to wind, rain and sun. Accuration® Block is scientifically formulated to be fed free-choice to mature beef cows, sheep and goats along with forage. 1. Consumption of Accuration® Block should be approximately 1.5-2.5 pounds per head per day for cattle and 0.5 to 1.0 pound per head per day for sheep and goats depending on quality and quantity of forage. 2. Provide one 500 pound block for each 20 to 25 head of cattle or 50 to 75 head of sheep/goats, one 200 or 250 pound block for each 10 to 15 head of cattle or 25 to 40 head of sheep/goats. 3. Several weeks prior to, and during feeding of Accuration® Block, provide a good quality mineral supplement that contains phosphorus. 4. Adequate forage should be provided at all times. 5. Prior to introducing Accuration® Blocks, animals should be accustomed to high forage diets. 6. Do not offer Accuration® Blocks in fields where crops are grown that are known to contain high levels of urease enzyme such as soybeans or in conjunction with other NPN containing feeds. 7. Accuration® Blocks in boxes should be fed in the base of the box on well-drained ground. 8. Feed Accuration® Blocks near the area where animals loaf and/or a water source. 9. In large pastures, Accuration® Blocks should be available in more than one location. 10. If animals run out of blocks, observe them closely for three days to prevent overconsumption after refeeding. 11. Provide an unlimited supply of clean fresh water. Consumption of Accuration® Block will vary depending on quality of forage, quantity of forage, condition of cattle, sheep or goats,previous feeding programs, and Accuration® Block feeding location. Animals may need to adapt to Accuration® Block before the correct consumption is reached. If consumption is low, examine forage quality and the block feeding location. If consumption is higher than desired the quantity/quality of forage may need to be increased, the blocks can be placed further away from the loafing or watering area, and/or reduce the number of blocks available to animals.